September's self-portrait was taken in the bedroom in our rental house in Arizona, using the Fisheye Lens that I rented earlier in the month. Since shooting with the lens was one of the highlights of the month, I thought it was fitting for me to use it to take this month's portrait. 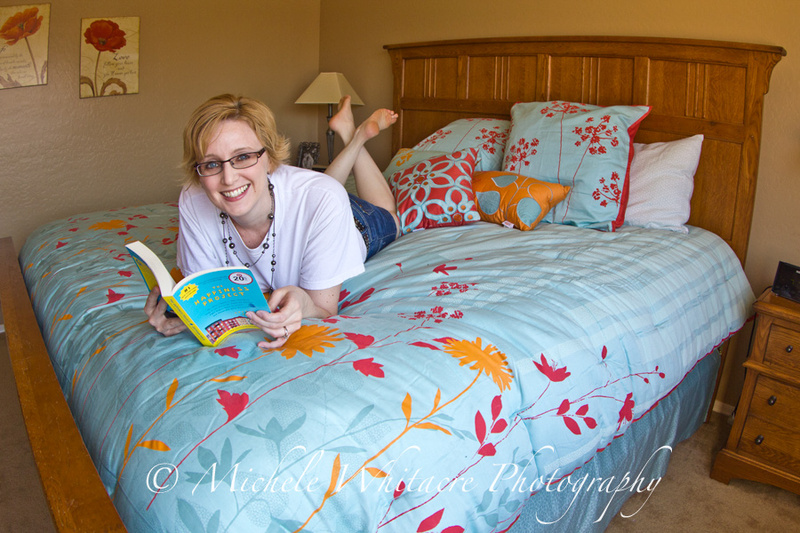 I decided on a photo of myself holding a book, while relaxing on the bed, because reading is one of my favorite things to do! Now that we are (mostly) unpacked, and things are starting to settle into more of a routine around here, I'm slowly starting to find time to do more of the things that I enjoy. If you look at the book I am holding, you will see that it is called The Happiness Project. I saw this book at the store quite a while ago and though it looked like an interesting read. I finally decided to buy it and start reading it recently. As I'm reading, I'm putting together my own version of a happiness project of sorts. I feel like my life has been passing by me mostly unnoticed in recent years because I haven't taken the time to stop and see the good around me. I'm trying to make a conscious effort to change that, and hoping that the book will help me to do just that. I've been really excited to see that the light in our rental house is amazing for photos! I haven't spent too much time taking indoor photos here yet, but the few I have managed have really shown the great light. If I'd decided to try to take these self-portraits in our old house in Indiana, I would have really struggled. The lighting in that house was atrocious, and I'd cringe any time I had to take photos inside there. Love the bedding! I think I'm going to have to check out that book too. Thanks, Debbie! So far it is a great book. If you check it out, I hope you like it.